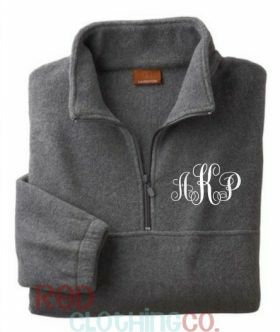 We love these monogrammed pullover jackets! With our Unisex Fit quarter-zip pullover, you can add southern style to your wardrobe! We'll personalized this pullover jacket with your choice of thread color in the style font and wording you prefer. It's perfect for crisp weather this fall and winter. Received as a Christmas gift and love, love, love it!! Ordering a second one! I love it! It is perfect and will be a great gift. Thank you so much! The fit, quality and color!